Russian-Hebrew journalist and author; born at Satanow, Podolia, April 15, 1832. He received his early Hebrew education under J. Z. Polichinetzki, author of "Ḳero Miḳra," and then under the supervision of his own father. After the death of the latter in 1853, Nathanson went to Odessa, where he devoted himself to both sacred and secular studies. There he cooperated with Jacob Israel Levinsohn, the nephew of Isaac Baer Levinsohn, in copying and revising the latter's manuscripts. Nathanson was occupied for three years on Israel Baer Levinsohn's "Aḥiyyah ha-Shiloni ha-Ḥozeh" and "Zerubbabel." In 1875 Nathanson went to Warsaw in connection with the publication of the complete works of Levinsohn. Nathanson's first article, "Le-Torah weli-Te'udah," was published in "Ha-Maggid" in 1864. The more important among his articles, contributed chiefly to "Ha-Meliẓ," are: "Tekunat Sefat 'Ibrit we-Hargashoteha" (1868); "Kerobaz (1869); "'Al ha-Ẓaddiḳim we-'al ha-Ḥasidim" (1869); "Lefanim weha-Yom" (1870); "Zikronot le-Ḳorot Odessa" (1870). 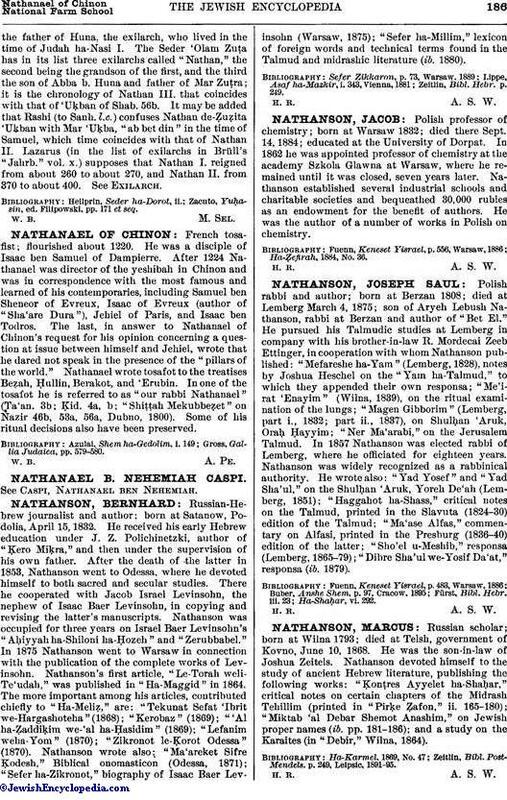 Nathanson wrote also: "Ma'areket Sifre Ḳodesh," Biblical onomasticon (Odessa, 1871); "Sefer ha-Zikronot," biography of Isaac Baer Levinsohn (Warsaw, 1875); "Sefer ha-Millim," lexicon of foreign words and technical terms found in the Talmud and midrashic literature (ib. 1880). Zeitlin, Bibl. Hebr. p. 249.